A marching band is performing outside Malta’s Grand Master’s Palace. The mostly white-haired gentlemen wear what appear to be military uniforms. Their horns and drums echo off the 500-year-old limestone walls of downtown Valletta, the country’s capital, and fill our third-floor Airbnb apartment with song. My husband Greg and I watch from a traditional Maltese balcony. These colorful barnacles clinging to most of the city’s buildings look like a cross between a bay window and a phone booth. The story goes that they’re a throwback to Arab rule, when women had to be protected from prying eyes below. The sun sets and the band finishes. Its admirers collect their grocery bags before heading for home down stone alleyways. But for us, fresh from an early evening flight from London, the night has just begun. We unpack long enough to find our jackets—those Mediterranean winds are strong—and go out to explore. Two hours later, we feel as if we’ve covered the whole city. 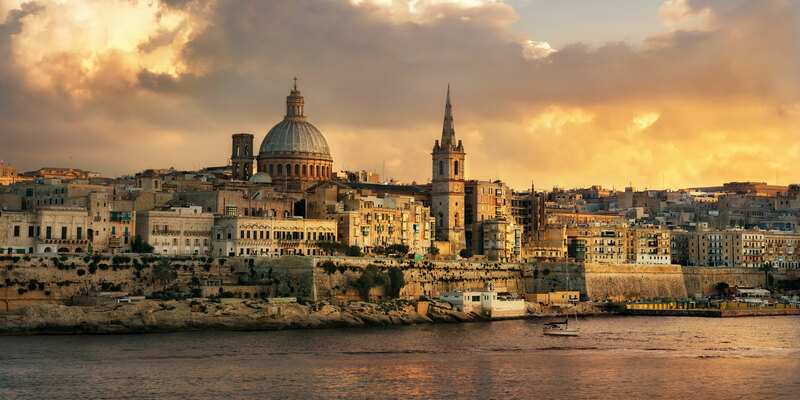 Valletta is home to only about 6,500 of the country’s 450,000 residents. Geographically, Malta is small. So small that on many world maps the dot that represents the capital covers the whole island, which lies about 80 kilometers (50 miles) south of Italy in the Mediterranean. We’ve walked past the teens texting and flirting on the steps of the recently revamped Royal Opera House. Past the shuttered doors protecting the 7,000-year-old tools and jewelry in the city’s National Museum of Archeology. Past the Casa Rocca Piccola, a 16th century palace that now serves as the home of a Maltese knight. Back in our apartment, the church bells tell us it’s time for bed. We have one more glass of wine on the balcony. Below us the city is silent. The next morning, the same church bells that signified nighttime now let everyone know the sun is up. From our room, we can hear and see the city greet the day. Wooden balcony windows creak open. Laundry flaps on squeaky clotheslines. Someone rolls a cart of bread down the cobbled street. Valletta is not a city for sleeping late. Downstairs, the local population has been joined by a flood of cruising day-trippers. Judging by the accents, most have sailed in from the U.K. Before coming into its own, Malta was governed most recently by Britain. Though it has been independent for more than a generation, its capital city’s streets are still dotted with red phone booths and pubs serving brown ales and bitters. Before the Brits, Malta had been ruled by the Romans, the French, North Africans, and the Normans, to name a few. Its prime Mediterranean location—just south of Sicily, east of Tunis, north of Tripoli, and west of Crete—enticed many conquerors over the millennia. In Valletta, you can taste the invasions. We pass a Sicilian pizzeria and an unmarked window with a spinning stick of what looks and smells like shawarma. We consider a chalkboard sign advertising variations on fish and chips before settling into a table perched charmingly on the stepped sidewalk. The restaurant is called Gugar and its menu offers several versions of ftira, a Maltese bread that can be stuffed like a gyro, topped like a pizza, or served open-faced like a bagel. Greg orders his with ricotta, walnuts, and feta. Mine overflows with eggs and poppyseeds. 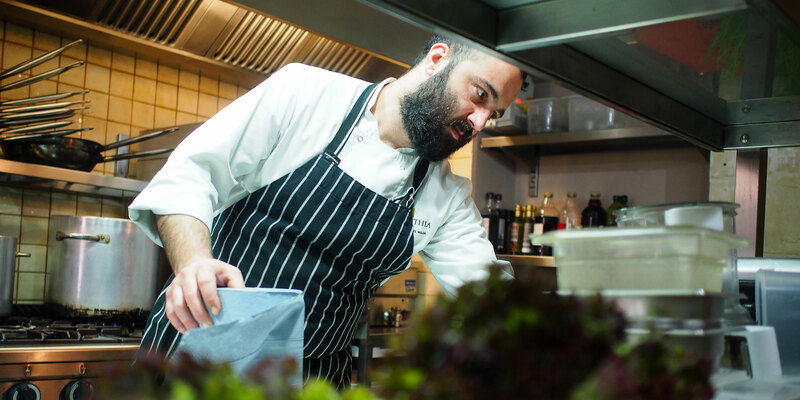 As we eat, it strikes us how orderly Malta is compared with some of its Mediterranean neighbors. The bus schedule is accurate (a sharp contrast to the ticket vendor in Milan who explained that “the train comes every 15 minutes—unless it doesn’t”). The greeters outside restaurants don’t shove menus in your face. 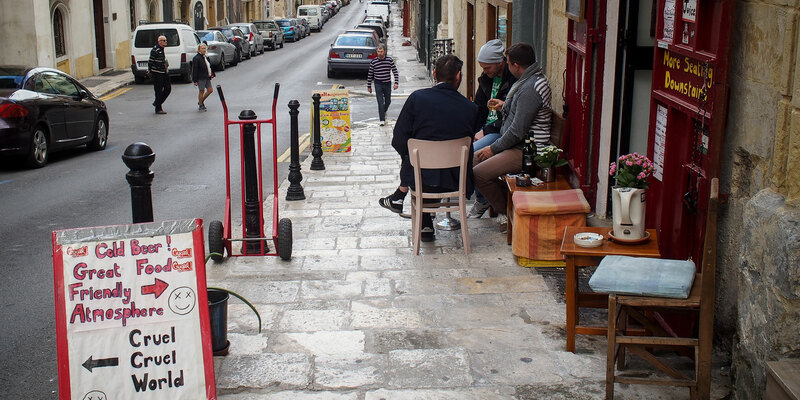 The gentlemen at the cafes simply nod at the island’s fairer visitors before returning to their conversations in Maltese, which, to ignorant ears, sounds like a nonsensical blend of Arabic and Italian. The battles that influenced this country’s cuisine and language also shaped its capital. Literally. 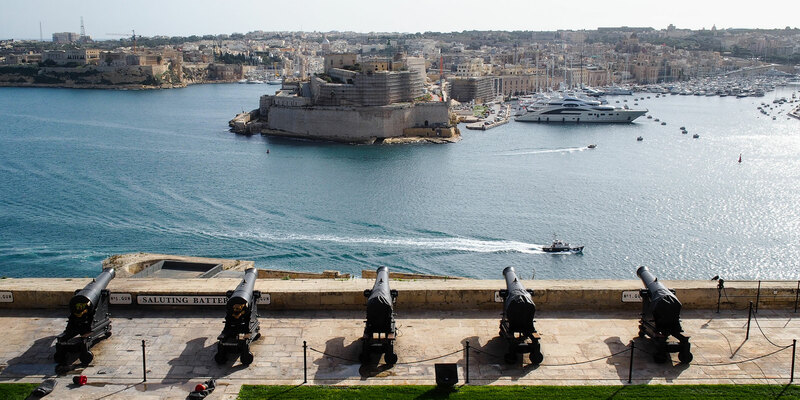 Valletta is a town designed for war. Since its founding nearly 500 years ago, ramparts have been built, ditches dug, and stockpiles made in case of invasion and siege. The story of the country’s long fight against almost every one of its neighbors is told at the National War Museum. We weave through halls of prehistoric weapons, medieval armor, and the wingless wreckage of war-scarred aircraft. Across town, at the Upper Barrakka Gardens, the walls that once protected this city now serve as lookout points. Leaning over a metal balcony, we can see the island’s last dghajjes sailing across the sapphire water below. Thousands of these traditional Maltese water taxis used to cruise the Grand Harbour but now only 20 or so remain. They’re reminiscent of gondolas, but most have engines. The boats, dwarfed by cruise ships and luxury yachts, ferry tourists and locals across the bay. The drivers wave to local fishermen out to catch their dinner. Beyond the harbor is another day of exploring. A few miles south and a few feet underground is the Hal Saflieni Hypogeum. Nearly 7,000 bodies rest in this subterranean gravesite, which was carved 6,000 years ago into the island’s bedrock. Farther south, on the other side of the airport, are megalithic temples whose construction started before the great-great-grandparents of Stonehenge’s builders were born. 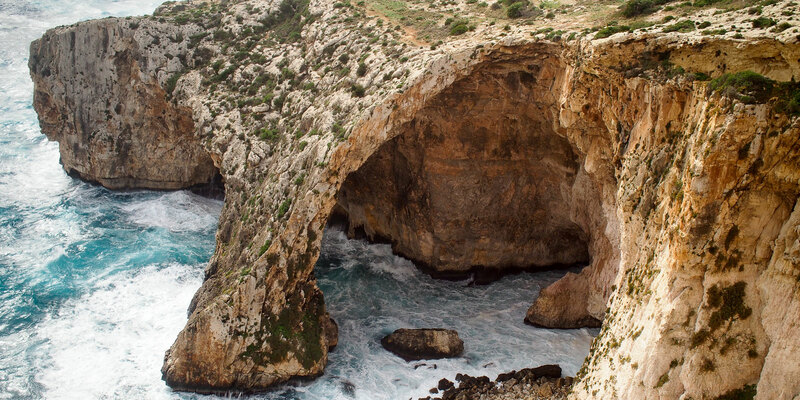 Just east of that is the Blue Grotto, a 100-foot stone arch carved into the island’s side by centuries of hardworking waves. If the church bells wake us in time, we might get to tour the grotto by boat. The sea is usually calmer in the early morning. But now the bells toll for happy hour. 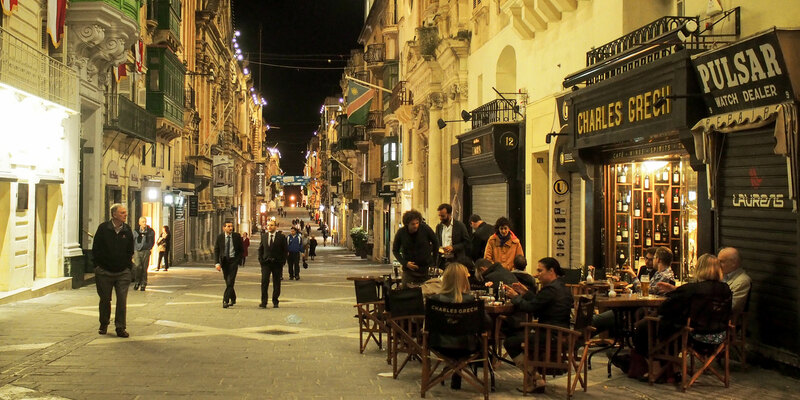 Like so much of Valletta, the city’s nightlife was shaped by war. The cruise ships are already on to their next port of call. We have the sidewalks to ourselves as we traipse to Strait Street, the former playground of World War II soldiers. Malta was a stronghold for the Allies in their fight against Italy. At the end of the war day, the soldiers stationed here headed to Strait Street for drinks, music, and female company. The languages mixed; the music played. Teenage drag queens sang for sailors; savvy Maltese ladies wooed them long enough to get a new frock before disappearing down a cobbled side street. In its Maltese Catholic shell—after all, this was the last country in the European Union to legalize divorce—the mix of prostitution, debauchery, and jazz created a playful naughtiness that lives on today. At Tico Tico, a replica of the Maltese balconies that once kept women out of view is now a display case for their undergarments. Outside, the brightly colored tables lining the narrow street are filling up with locals, olives, and wine. Across the alley, it’s a classier affair at the ­cavernous StrEat Whisky & Bistro. Underneath the limestone archways, well-heeled patrons sip cocktails made from StrEat’s 200-strong whisky collection. We try a 15-year-old single malt that tastes of flowers and cream and then an oaky and spicy blend from India. Then we agree it’s time for food. It’s a short walk to La Mere, where a waiter slips us into a wooden two-top illuminated by a purple pendant lamp dangling from the rafters. We’re led through a menu of Indian, Arabic, and Mediterranean cuisine: curries, masalas, and tagines alongside local specialties like fried rabbit and Maltese sausage. We soak up the whisky and the bottle of wine we ordered with local peppered cheese, nut-stuffed Lebanese pastries, and garlic-soaked lamb.